Take a Dip Pool Party - Home. Made. Interest. 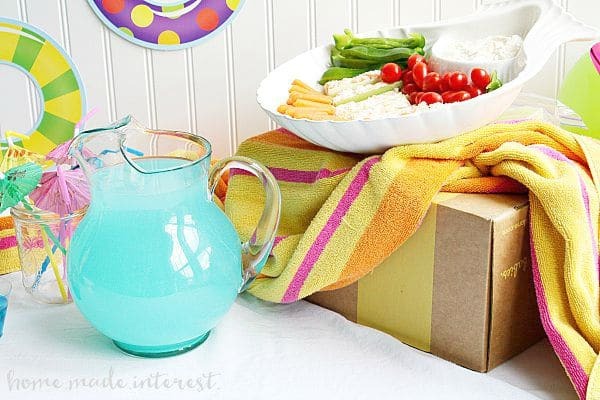 Host a “Take a Dip” Pool Party to say goodbye to summer before the kids head back to school. It’s the end of July, which means that here in Maryland we have a little less than a month until school is back in session. It’s bittersweet for me. My son will be starting kindergarten this year! I’m so excited for him to start this new phase of his life, but I can’t help being a little sad that my baby is growing up so fast! 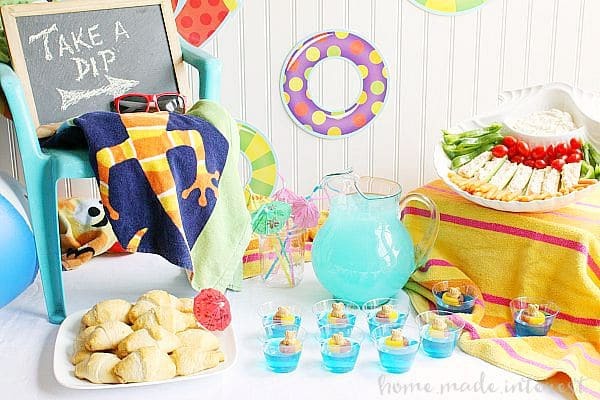 We’re trying to soak up every last bit of fun the summer has left in it and I thought it would be fun to plan an end of summer, back to school, pool party with some simple recipes! Our party theme was “Take a Dip” and we planned our food around that. This was a pool party so we wanted to keep things light, and kid-friendly. Getting a kid out of the pool long enough to eat something is never easy so we everything needed to be easy to grab and go. 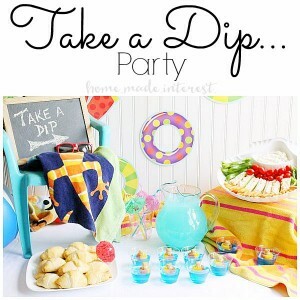 Since the theme was all about taking a dip, and it isn’t really a party without dip to snack on (dip…get it? 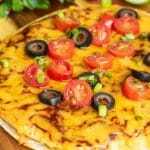 ), we incorporated Kraft Dips into some of our recipes. We started with a simple veggie tray filled with carrots, tomatoes, green peppers, and Kraft French Onion Dip. We also added stuffed celery. Have you ever had stuffed celery? Kat grew up eating celery stuffed with pimento cheese, it was one of her favorite things as a kid, but I had never had it. We changed it up a little with a crumbled cheddar cheese and french onion dip mix rather than pimento cheese, and stuffed the celery sticks with it. Portable veggies filled with creamy dip…what more could a kid want? 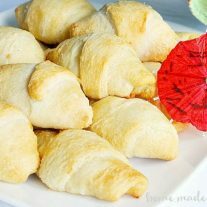 Next up was our Kid-friendly Chicken Salad Crescent Rolls (see recipe below). This is not your typical chicken salad. We cooked and shredded chicken, then mixed it together with Kraft French Onion Dip, cheddar cheese, and cream cheese. We put a small amount in each crescent roll, rolled them up, and baked them until they were golden brown. I’m not going to lie, I wasn’t sure how this recipe was going to turn out but in the end they were awesome! Kat and I couldn’t stop eating them and neither could the kids! They were perfect for the kids to grab and eat quickly in between playing. For a light dessert we skipped the cupcakes and went straight for Jello-O. To stick with the theme we used blue Jell-O and put it in individual cups so it was easy to hand out to the kids. We topped each mini “pool” of Jell-O with a gummy ring and a small bear cookie. They looked so cute and the kids loved them. Last but not least, the drink. 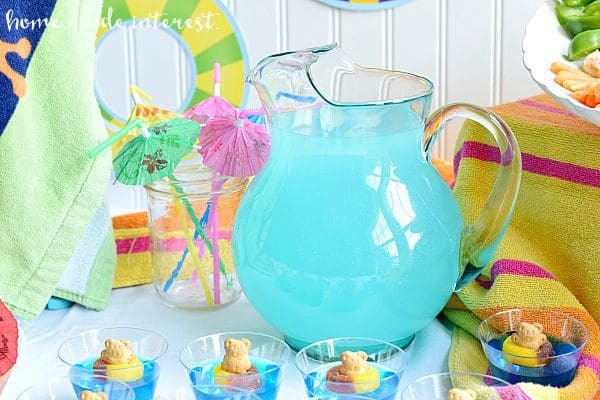 Of course we had bottled waters for the kids and parents, but Kat and I also wanted something fun to go along with the Take a Dip theme so we made blue raspberry lemonade flavored Kool-Aid and substituted half of the water for pineapple juice. 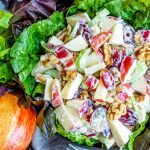 It had a great sweet and tart flavor and it was so easy to make. 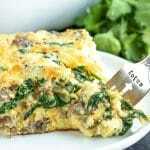 We mixed it up the night before the party and just pulled it out of the refrigerator when guests arrived. We even found super-cute umbrella straws to drink it with! We didn’t go crazy decorating the whole house for the party since the main action was going to be happening outside but we did want a beautiful table and we were so happy with how it looked! 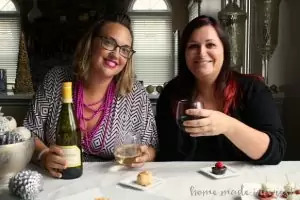 We started with a basic white tablecloth, some inexpensive pool party cut-outs that we found at the party store, and an inflatable beach ball. We wanted to add a little height to the table to make it look full. Melinda found a small child’s outdoor chair that worked perfectly! 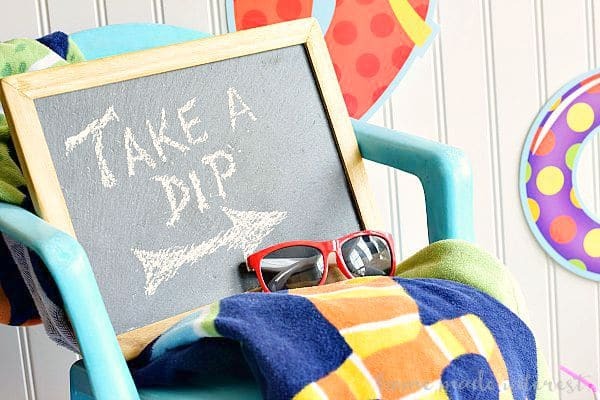 We sat it to one side, draped it with a beach towel and put a “Take a Dip” chalkboard sign in it. Then on the other side we used a simple cardboard box. That is one of the easiest ways to add a little height to items on a table. Since this party was all about the pool it was easy to just drape a big beach towel over it and call it a day. The food did the rest of the work, filling up the table and making it look beautiful. We were really happy with how it turned out and all of our guests had a great time. 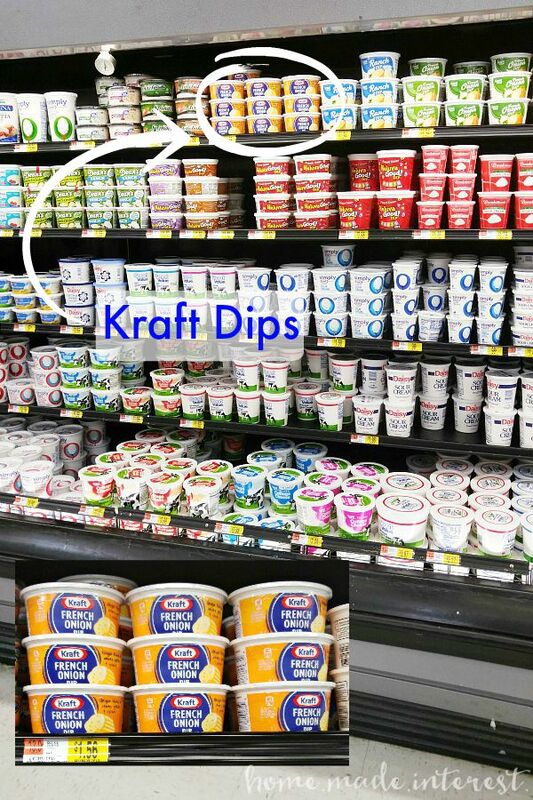 Kraft Dips are key to having great snacks for entertaining occasions and there are three flavors you can choose from Kraft French Onion Dip, Kraft Green Onion Dip, and Kraft Bacon Cheddar Dip. 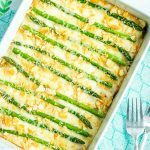 You can use them interchangeably in our stuffed celery and crescent rolls so give them all a try. 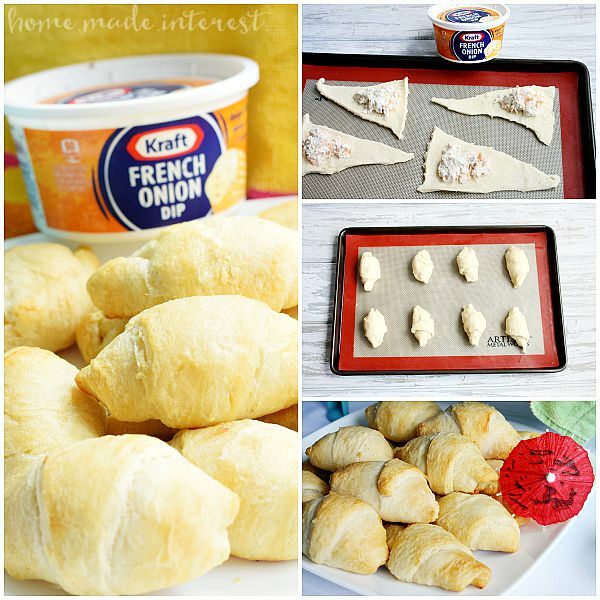 I think chicken and Kraft Bacon Cheddar Dip crescent rolls sound pretty awesome. You can find all three at Walmart in the refrigerated section. Just look for their newly updated containers! Flaky, golden brown crescent rolls filled with creamy Kraft French Onion Dip, cheese, and shredded chicken. Mix chicken, Kraft French Onion Dip, cheddar cheese, and cream cheese together in a bowl. Separate crescent rolls and fill each one with a small amount of chicken mixture (about 2 Tbsp). Roll up crescent rolls making sure they are sealed on the edges so they won't leak as the cheese inside melts. Cook for 11-13 minutes, or until golden brown. « Previous PostTime Management Tips for Bloggers + Awesome Deal on Finish® products! What a gorgeous little party. I love those teddy’s in the pool….so adorable! 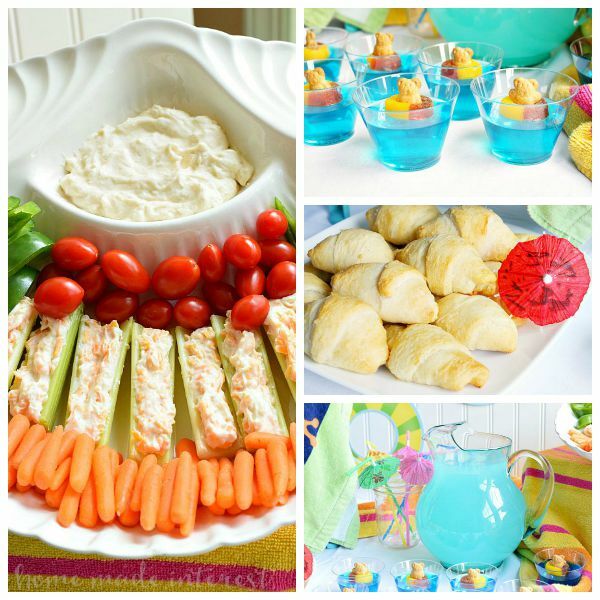 Such great ideas for a pool party! 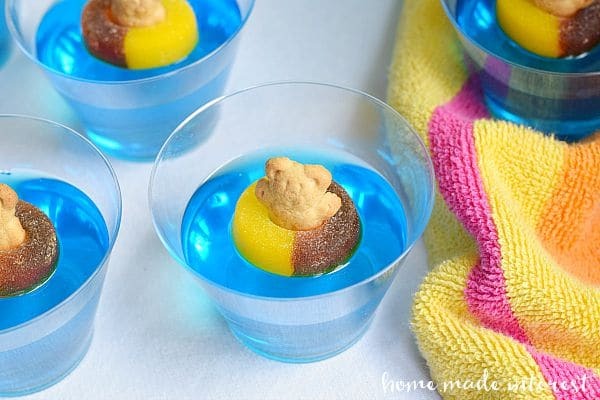 I love the little blue Jello cups with the bears…how adorable! 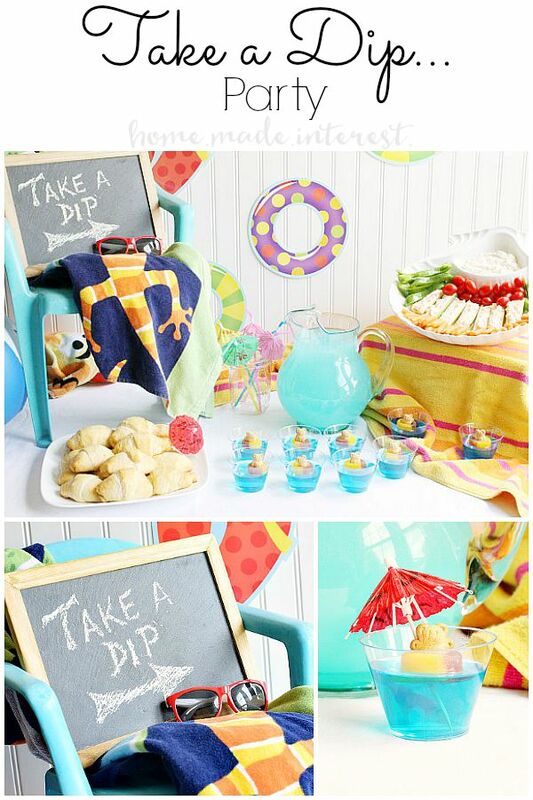 Take a Dip – what a great idea for a pool party theme! I really like the play on words and your food and decor are gorgeous and fun. The take a dip jellies are soooo cute! Love them! 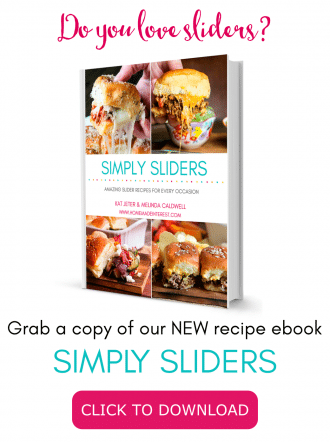 this looks like such a fun party – love the theme!